The RainStoppers™ color changing umbrella is sure to wow with every use. A 46" Auto open umbrella is finished with a wooden hook handle. 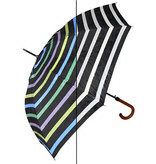 The canopy is printed with white stripes--once wet, the print turns multicolor! Master Pack Dimensions: 38.5 "x 7" x 10.5"